New York Magazine’s website The Cut brings you all about fashion, beauty, fame and more. And it reveals why Pestle & Mortar Erase and Renew are a cut above the rest! Cleansing your way to Better Skin! I spent much of my teens and early 20s covered in benzoyl peroxide goop, and nothing has willed my skin into non-embarrassing territory more effectively than a rigorous face-washing routine. Believe me, cleansing twice at night and once in the morning is a necessary practice for clear, cooperative skin! Why Erase & Renew are The Absolute Best Cleansers! These cleansers arrive as a pair in Pestle & Mortar’s double cleansing system. The first is Erase, a light-as-air balm. The women behind Pestle & Mortar — a biochemist and a skin-care fanatic —whipped super-light oils like grapeseed and sunflower together to formulate the nearly fluffy concoction. The oils rip through makeup, dirt, and oil, and are completely removed with the aid of the system’s muslin cloth. Your face feels smooth after each use! Erase is followed by Renew, which is another cleanser, but smoother and even lighter. Fruit enzymes deliver the promise of more even skin tone over time, and the addition of glycerin and vitamin E condition skin in a way that your face never feels taut after the double-duty wash. After massaging the balm over your face, you remove it with the smooth side of the kit’s muslin cloth. Pestle & Mortar’s Double Cleansing System is a cut above the rest! 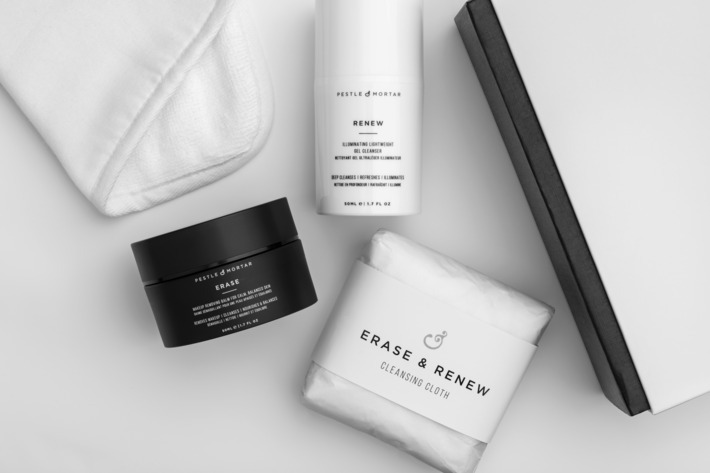 Additionally, unlike other industry favorites, Erase and Renew are developed without much-maligned mineral oil. Most important, the system simply cleans my skin better. It’s hard to find face washes that simultaneously cleanse well and feel good. That this double-cleansing system does both is more than a small victory! ← Busted:The Real Truth about Makeup Removing Wipes and Cleansing your Face!